Yesterday I spent most of the day working on some big mosaics that I’ve been trying hard to complete. I was having a great time but my daily mosaic kept nagging at me. I wasn’t seeing an image for it though. I was scheduled to go to a spring equinox workshop in the evening and I decided instead of forcing the daily mosaic I would create it when I got home from the workshop. I knew it would be late but it felt right. Well, within the first 15 minutes of the workshop I had the image for my daily mosaic! We were talking about the spring equinox as a balance point gestating and sprouting. I quickly drew what I was seeing. 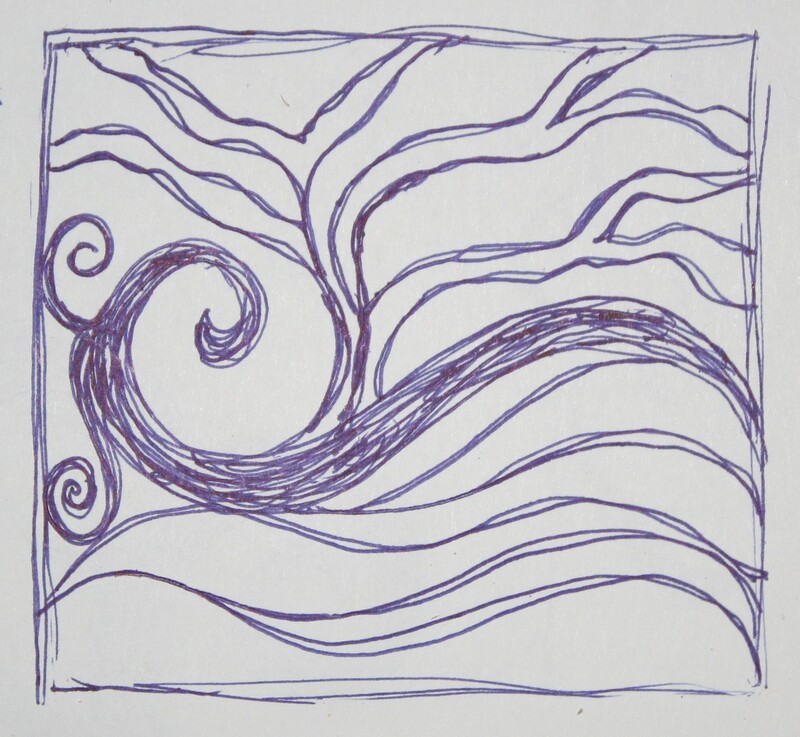 The bottom part of the design represents the winter when we’re still, planning what we want to bring forward. The top half is the growth of spring. I started working on it as soon as I got home. I started with the center swirl using beads. Well, it’s not easy to manipulate a string of beads and have them stay in a tight curve. I decided to put a weight on them and let the glue dry before I continued. For some reason the glue decided to dry very, very slowly. 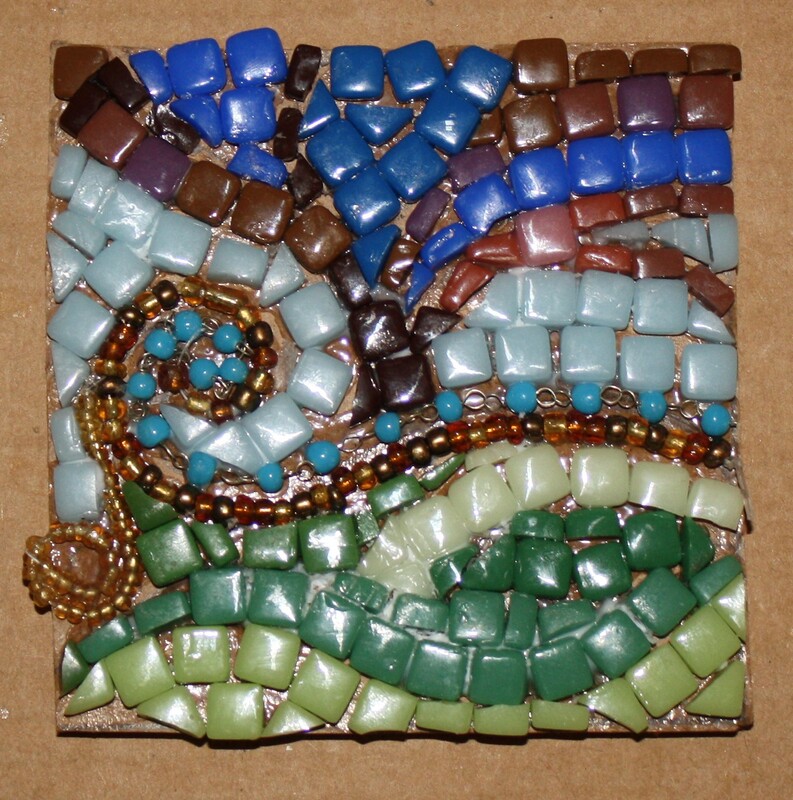 I ended up completing the mosaic with the weights still on the beaded part. I couldn’t take a picture of it that way so I decided to go to sleep and let it dry over night. The glue is still not dry in some places but at least the beads are now staying in place. I guess grouting will have to be done late today. This process was a reminder for me that sometimes I just have to let things go and see what happens. I have to trust that everything will work out. It always does.